يتميز كراون بلازا كوينزتاون بموقع مركزي رائع يطل على بحيرة واكاتيبو وسلسلة جبال ريماركابليس، وتوفر جميع الغرف إمكانية استخدام شرفة خاصة أو ساحة الفناء. يتميز كراون بلازا بغرف واسعة وعصرية مفروشة بشكل جيد، وتحتوي الغرف على مناطق جلوس كبيرة وتلفزيون مع قنوات فضائية، كما توفر كل غرفة إطلالات على بحيرة واكاتيبو أو الجبال أو ساحة الفناء الخاصة. يقدم مطعم Threesixty المتوفر في الموقع المأكولات العالمية ويطل على بحيرة واكاتيبو الخلابة من خلال نوافذ ممتدة من الأرض حتى السقف، كما يمكنك الجلوس والاستمتاع بنبيذ العنب الأسود من منطقة سنترال أوتاغو المشهور محليًا في منطقة البار والصالة المريحة. تتوفر خدمة صف السيارات، كما تتوفر غرفة آمنة لتجفيف معدات التزلج/ألواح التزلج لاستخدام الضيوف مجانًا. يُرجى ملاحظة أنه يتم تطبيق تكلفة إضافية بنسبة 1.5% عند الدفع ببطاقات الائتمان. يُرجى ملاحظة أن الضيوف يحصلون على 45 دقيقة مجانًا من خدمة الواي فاي لكل جهاز في اليوم الواحد وبحد يبلغ واحد غيغا بايت. ويتم تطبيق تكاليف إضافية للاستخدام الإضافي. كما يتمتع ضيوف IHG Rewards بخدمة إنترنت قياسية مجانًا. Don’t bother with IHG rewards go Agoda.. even after being a long term member after trying my IHG app and their reservations department twice.... I still got a better no hassles deal with Agoda! Great property and staff !! 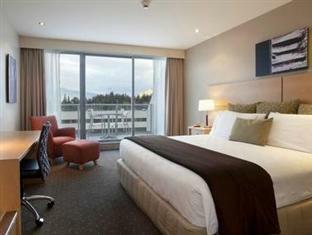 We enjoyed our time at Crowne Plaza Queenstown. Unfortunately the weather was very unpleasant during our stay, but the staff really helped us out as best they could - the concierge was excellent in checking and re-checking whether we could take our planned helicopter flight. And the front desk staff helped us on more than one occasion recommending good places nearby to eat and drink and waited out the weather. Very short walking distance to the famous Ferg Burger which was worth the visit! The breakfast at the hotel is very high quality. We enjoyed it each morning. 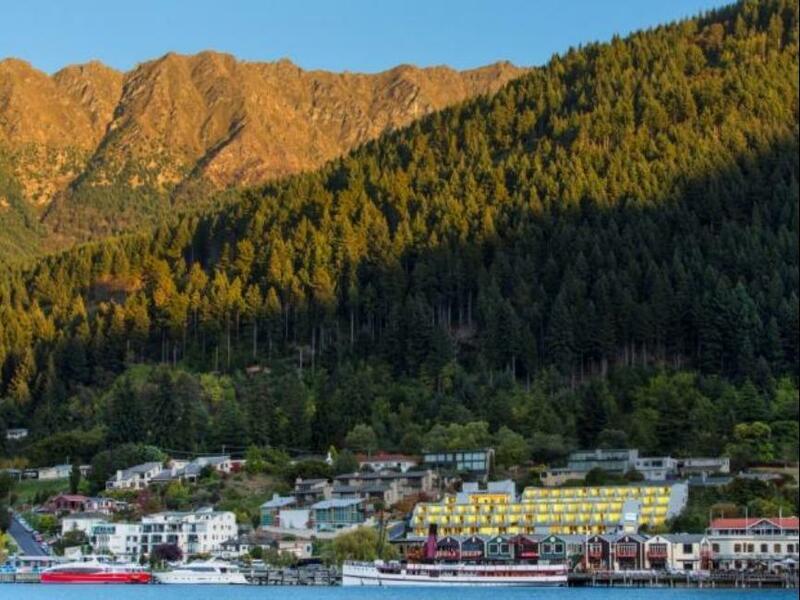 The hotel is located right inside the city center and one of the most popular travel agent is located right opposite so for those of you who plan to visit Milford Sound or Walter Peak it is very convenient. We booked the Garden View Double Room and got upgraded to Lake View, the View was fantastic. We did not get a chance to check out the hotel although we stayed for 2 nights. Cannot comment much on the facilities. The room is very spacious with two twin bed (queen size) so was really conformtable. We stayed here just for a day after trekking trip to have a rest before flying back to town. We were exhausted after long trekking and wanted to have shower and had a good sleep with comfy bed. The room is not spacious but very clean and had all what we wanted. Hot shower with high water pressure, strong hair dryer, clean and fluffy towel and bed with nice springs. From outside, this hotel looks a bit shabby but interior is decorated nicely with simple modern fitting. Nice for short stay but for long stay may be a little tight due to limited room size. They don't have car park so they drove my car to another parking and needed to pay additional parking fee. They provided us car drive service so didn't need to walk up to car park but this was a bit troublesome. Also wifi is not free so need to sign up some membership (free membership but need to fill in the form). I am writing some negative point with hoping that they can improve these in the future. We stayed two nights at the Crowne Plaza and thoroughly enjoyed our stay. It is very close to town so we could walk to local bars and restaurants. The hotel was very good value, the staff were great and the rooms were comfortable and clean. 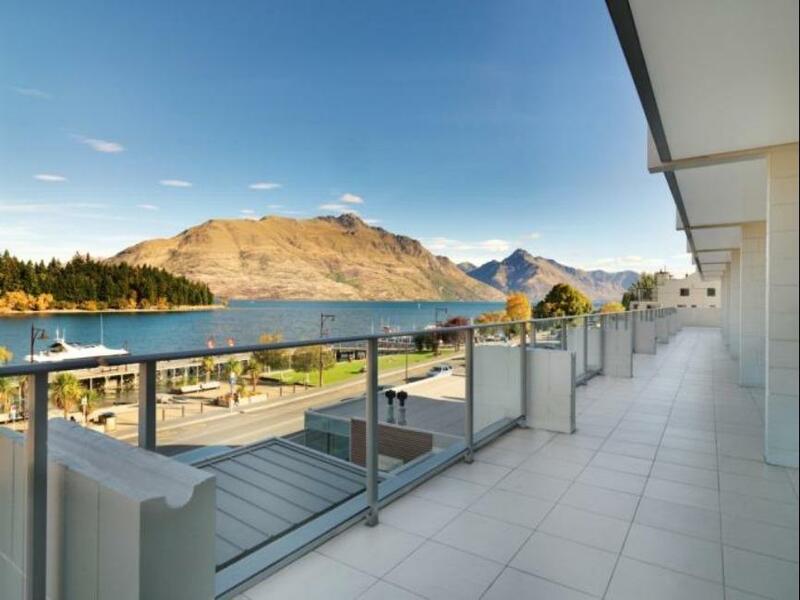 We would recommend this hotel if you are coming to Queenstown. very good location, clean room, good food, kind staffs! The location is perfect as it’s close to shops & restaurant. Staffs are friendly & helpful. Great location with view of the lakefront. we were staying facing the lake during new year eve. we could see the fireworks from our bed. Lol. Superb location. Very well located across the lake, but facilities are outdated (gym is incredibly small) and internet is very slow. This hotel is in a great location close to restaurants, shopping and tour companies. 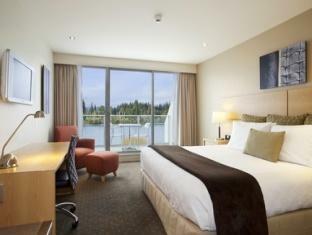 Beautiful lake view from front facing rooms. Friendly, helpful staff in all areas. Coin operated guest laundry room which was convenient for a weeks stay. Restaurant had buffet or a la carte breakfast options, both good. Dinner dining was excellent and was comparable in quality and price to other restaurants in Queenstown. Location is top notch , overlooking the the lake (lake view option) Room was clean everyday with complimentary drinks and chocolate. Breakfast spread was excellent with breakfast overlooking the late as well. The Crowne Plaza has loads going for it - location, comfy beds, nice rooms, little extras like bottled water and chocolates before bedtime, robes etc. I was really disappointed with the restaurant though. We went for breakfast and ordered off the a la carte menu. Soggy, uncooked toast not buttered under the poached eggs; porridge served in a tiny bowl so that there was no room for milk and toppings, no milk with the porridge. I'm sure this all sounds really petty but when you are in an international destination in a four star hotel, I would expect better from the restaurant. Excellent. We enjoyed our short stay. 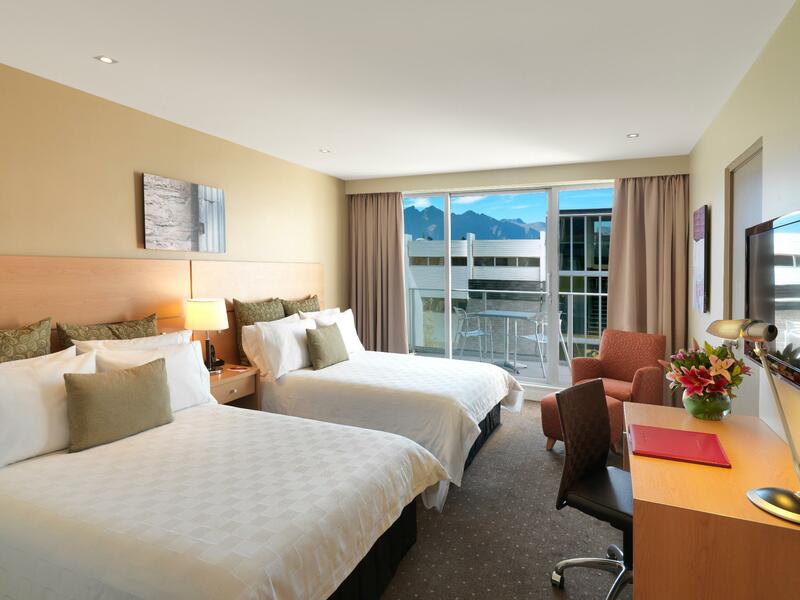 Crowne Plaza is the perfect place to be if you want to be in the heart of Queenstown city. We also paid an extra $59 for overnight parking, unlimited wifi and brekkie for 2 pax, which we think is a good deal. Location. Room Size. Breakfast . We had a very comfortable stay at Crowne Plaza. Considering we had 3 kids ( 4, 9 and 13) and 5 adults. The room size were good comfortable. The Breakfast was super nice and loaded with health options. The location was a bonus...coz we could simply walk around to most of the places on foot. Polite staff and very accommodating. Hotel staff even booked all our attractions for us so our billing was consolidated as well :). Will highly recommend it to any one who is considering to visit Queens town. We really enjoyed our stay and extended our intended nights. The staff was lovely. a room with a view is worthwhile but if not ceoss the road and you are there at lakes edge. Breakfast was lovely with a beautiful floor to ceiling glass window to watch the world go by. great access point for tours.